This picture makes me look photogenic confused. The pants and belt I got at H&M. I have been shopping there way too much lately, but at least I have not been doing it on my own. My beau thang has been going on shopping sprees as well, which I am not complaining about at all! Don't you like it when your boyfriend goes shopping with you without you having to drag him along? Love this outfit...so classy and chic !! Thanx for your lovely comment...Wanna follow each other ?? ..fabulous outfit Darling , love the trousers .. Such a classy look , following you now , you have a great blog ! lovely look!would you like to follow each other? You look very chic, I mean it, such a beautiful combination. I love the pants. Cute, polished look. 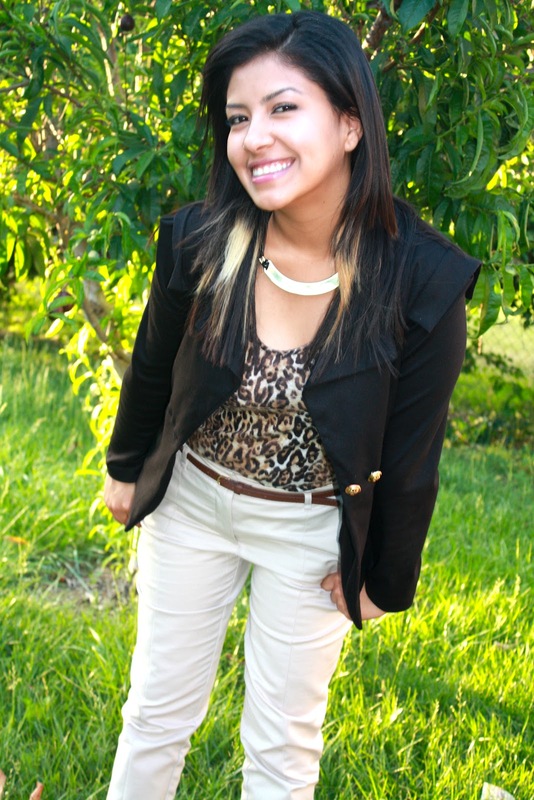 Love the leopard top and tailored blazer! amazing! *___* I love the blazer! This is so classy look, but yet trendy. Love this look! And your hair! OMG you totally brightened my day with your charming words! Your outfit is gorgeous and effortless. I love all the cute references under each photo too! Thanks for stopping by and visting my blog! Have a fantastic weekend! this is such an agressive but feminine look! love it!